I have added a couple of new items to the "freebies" part of the Virtual Garage Sale. Check it out if you like free stuff! Here are some access statistics for the photo mentioned below. 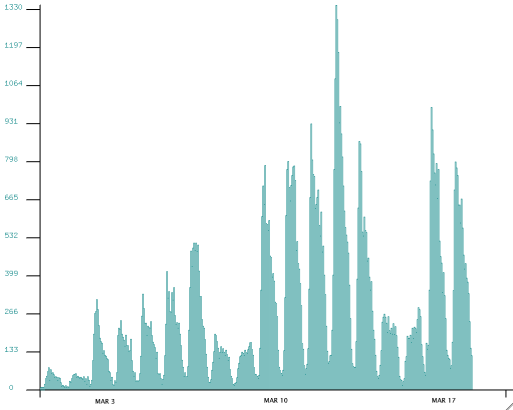 This graph shows the month of March only, up to yesterday. Each vertical line represents the number of successful loads per hour. You can easily see the midday peaks, and that the traffic on weekends is quite a bit lower. The total number of hits since November now stands at 160,953. It seems that this photo of weapons inspector Hans Blix and the Iraqi foreign minister Naji Sabri that I modified slightly and animated (for a Photoshop contest on Fark.com) has been making the rounds as an e-mail attachment. According to my log files, this file reached a peak access rate of about 2500 hits per hour during the few days back in November when the contest was on Fark's main page. The rate dropped to about zero until last month, when it started picking up again. It reached a new peak of 3400 hits per hour, and most of these accesses were from e-mail accounts. The total number of accesses in November and December was 7707. As of a couple of days ago, the total number of accesses to this photo was 111,314. Wow.